Drunken incoherence or unfortunate jokes won’t be a cause for regrets for iPhone users anymore, with the emergence of a new app that allows users to remotely delete all traces of text messages and photos before they are even seen by recipients. It lets a user delete a message or a whole conversation (a “string”) with another person or persons, with the content “immediately and permanently” removed from all involved phones as well as the String servers. The process is dubbed “untexting” by the app’s developer, the Seattle-based Be Labs company. The app provides a user with an opportunity to easily select, who to start a conversations with, and remove people from the “string” at any time to guarantee privacy. It allows a user to have multiple conversations with the same person on different subjects, due to each “string” being a unique conversation. Strings also prohibits the download of text messages, photos and videos, and saving them in private folders, without the permission of the sender. Furthermore, if a user removes himself from a conversation, String will instantly delete all of his messages. 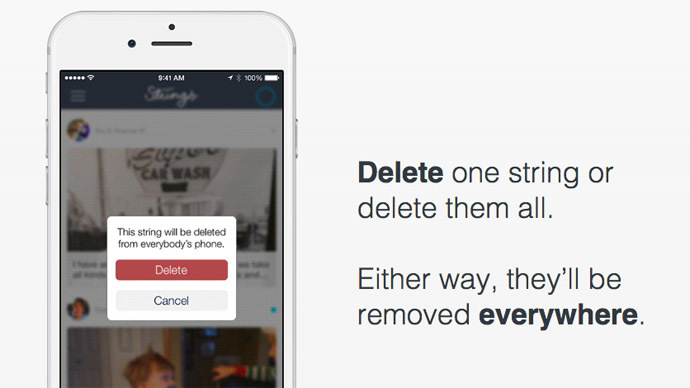 If one deletes a photo, video or chat he created, they’ll be terminated on all devices they were sent to. And after an account is deleted all of the content related to it, including photos, videos and comments, is removed “forever,” the company said. The beta testing for the app, which began in October, has now been successfully completed, Be Labs said. "During the three-month beta period, app sessions increased 700 percent, new conversations increased 600 percent, and in-app comments increased by 1200 percent," Edward Balassanian, the company’s founder said. “By making it easy to control the context, content and audience for conversations, Strings gives us the confidence and comfort to have meaningful and personal interactions with family, friends, and colleagues," he said. However, remote removal of messages will only work if all involved users have Strings installed on their mobile devices. The app is distributed free of charge via iOS App Store, with an updated version scheduled to be released later in January. The developer provided no information of when or if Strings will become available for users of Android devices.